This is a fascinating read about an important and neglected subject – the children born to black GIs and British women in the 2nd world war. Graham Smith’s When Jim Crow meets John Bull: black American soldiers in world war 11 Britain has been an inspiration. It demonstrates the racist attitudes of the British government towards the presence of black Americans as well detailing the experiences those servicemen underwent. There is a chapter on the children, but only three of them are discussed. There was clearly room for more research. I was also inspired by David Reynolds’ magisterial Rich Relations: the American occupation of Britain, 1942-1945. I travelled all over the country to interview people, including South Wales and Scotland. I did not have many expectations of where I might find my interviewees, so the places were not really ‘unexpected’. As for non-geographical places, I was taken to considering the sense of ‘belonging’ and what its absence entailed. I make some notes by longhand then type them up on the computer. I also edit on the computer. I record interviews but make notes at the same time. I have published with MUP in the past (Modern Women on Trial in 2013 and a co-edited book in 2018: Labour, British Radicalism and the First World War) and have had a very good experience. MUP agreed to publish this current project as a ‘cross-over’ book, so were prepared to sell it in hardback at a much lower price, as well as include up to 50 photographs. I am still working on this project as I am trying to find a company who will turn it into a film, or several short films, for BBC or Channel 4. If you could go back and give yourself once piece of advice when starting out on project, what would it be? Get onto national radio earlier on, if possible. I was on Radio 4’s Women’s Hour in October 2016 and got a huge response. I managed to hear from as many people in the week after that broadcast as I had in the previous three years, when I had been on quite a lot of local radio stations with little effect. George Eliot’s Middlemarch. It is such an intelligent and all-encompassing book, covering politics, astute historical observation, a sharp critique of marriage, perceptive presentation of relationships, and so on. I read quite a lot of fiction of all kinds, although not sci fi (Margaret Atwood excepted). I also read some poetry. This is such a hard question! I would ask George Eliot, Jane Austen, Mary Wollstonecraft, Karl Marx, WH Auden, Sylvia Pankhurst, Eric Hobsbawn, Stuart Hall (cultural critic, not the radio presenter) Nelson Mandela, Toni Morrison, Michelle Obama and Malala Yousafzai. I would be very daunted cooking for them all! There are a lot of other people I would love to include, but twelve sounds enough to be going on with. 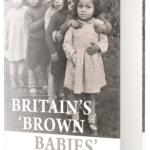 Britain’s ‘brown babies’ publishes on the 17th May 2019 and is available to pre-order now. 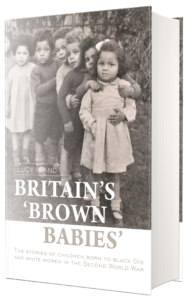 Lucy Bland is Professor of Social and Cultural History at Anglia Ruskin University, Cambridge.